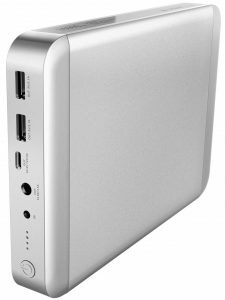 Here you can find the best Power Bank for Apple MacBook Pro. We have done a research and compiled the 3 best Power Banks you can buy in 2016. We have been lucky to find the best MacBook Pro Power Bank that compatible with your MacBook Pro and also using great technologies, providing fast charge, portable, strong and easy to use. The external battery packs is an essential accessory when you have smartphones, tablets, and other portable devices. If you need to stay long in a classroom or a meeting and need to handle heavy tasks you will need to use an external power bank to charge your MacBook Pro. Remember that, some power packs already included a MegSafe charging cable, so you don’t need to purchase it separately. Now it’s time check out our recommended power bank for charging your MacBook Pro. MAXOAK Power Bank is designed specifically to work great with all MacBook series including the new MacBook, MacBook Air, and MacBook Pro. 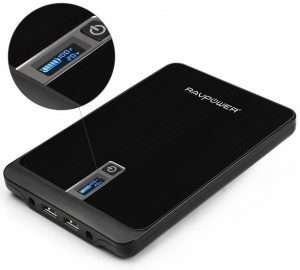 This power bank features a high 36,000 mAh capacity that can charge your MacBook Pro 13-inch about 1.5 times, MacBook Air and MacBook 12-inch about 2.5 times. This power bank also provides all essential cables for charging your MacBook, MacBook Air, and MacBook Pro. It also comes with a power saving and fasts charging power adapter that can recharge your power bank only in just five to eight hours. The Lizone Extra Pro Power Bank features a big 4,000 mAh capacity and packs with the newest technology from Lizone that can increase up to 10% more energy efficiency. This power bank can fully charge your MacBook Pro 13-inch up to two times, MacBook 15-inch 1.5 times and MacBook Air up to 3 times. This power bank comes with some DC cables for charging different brands of laptop including a MagSafe L cable for charging your MacBook Pro. 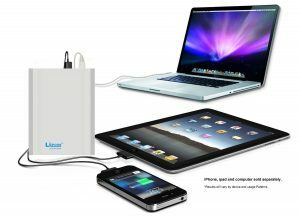 The Lizone technology provides a high DC power up to 4.5A or 90W that charge your MacBook Pro at high speed. This power bank using a high-quality battery cell that you can do recharge up to 600 cycles with 18 months warranty. This RAVPower power bank features a high capacity of 23,000 mAh or approximately 85.1 Wh that can do a fully charge your MacBook Pro 13-inch. It has 3 ports, two of them are USB smart ports that can adapt the amount of current to your connected device, and another is a multi-voltage DC port that allows you switch to 9V/12V/16V/19V/20V to comply with your MacBook Pro and other laptops. This power bank also features a smart LCD screen accurately displays of power level, charging status and voltage selection. It uses a high-quality lithium-ion polymer battery cells that allow you to do at least 500 recharging cycles. It does not include MagSafe cable, so you need to purchase it separately. Notice: The amount number of effective power bank battery capacity might be reduced upon energy loss through heat, cable, and the electrical circuit.